This entry was posted on April 27, 2008 at 11:12 pm and is filed under Uncategorized with tags dg wuz here lol hi anasofia. You can follow any responses to this entry through the RSS 2.0 feed. You can leave a response, or trackback from your own site. Aw. Kitteh confiscates pen to enforce proper kitteh-attention-paying protocol. You're lucky. A bunneh would eat the pen and destroy the newspaper and then tell you: "You were doing the crossword all wrong anyway." And despite her obvious hint, you then went and Voxed and delayed her attention even further! Oh, Tom. LOL. silly kitty. :Dgosh, mia would GO NUTS for her. I'm sure Ana-Sofia would love Mia, too. 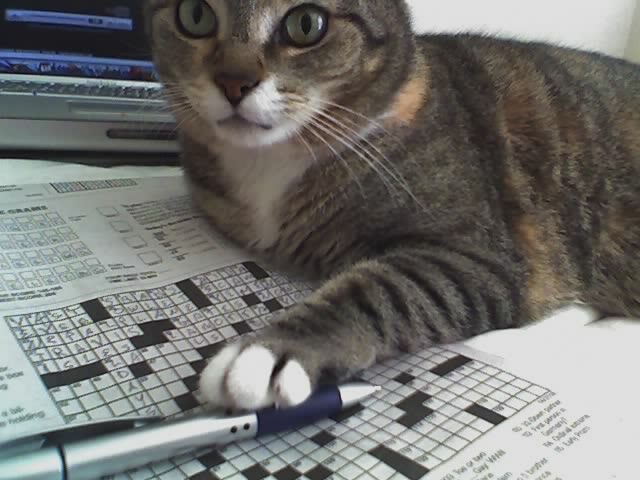 As long as Mia didn't ignore her by trying to do the Sunday crossword puzzle. Eep. *hangs head in shame*Eventually, she fell asleep with her head on the Jumble, so I was able to finish the crossword without further inconveniencing her. She agrees with you, Jen. ;-)As I've said: you just say the word, and I'll Fed-Ex her to you. I've been to your Vox, and I've seen pictures of actual bunneh mayhem. I lack the fortitude and courage to handle a bunneh, especially a mean one, so I'll stick with her royal fuzzy highness. Awww, who's a pwetty puddytat? oh, lawd. mia would prolly give her TOO much attention. hehehe. you should see her stalk my MIL's cat.